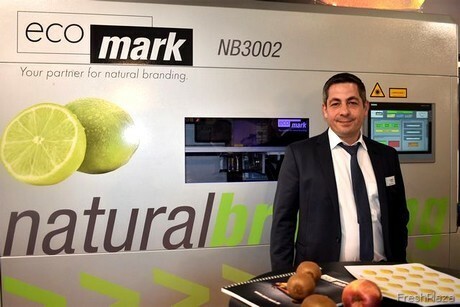 EcoMark GmbH is taking the opportunity to present its sustainable labeling at Fruit Logistica. Natural branding uses a laser to de-pigment the top cell layer of the peel and only remove the outermost layer of the shell so that there is absolutely no damage to the product. There are no restrictions on the products - even organic products do not matter. The product range for natural branding is growing, confirms the company. In the meantime, multiple products can be easily distinguished, from ginger to apple to celery or kohlrabi. The machines of the NB series are based on a modular principle. Even the entry-level machine is equipped with a conveyor belt that marks objects "on the fly", without stopping. The products can be placed on this individually or in finished containers or boxes. The camera automatically detects the location and orientation of the products. In a few milliseconds, the information is transmitted to the laser and each product is labeled according to preset criteria. All machines can automatically compensate height differences of 44 mm (+/- 22 mm). Depending on space or product range, the machine can be adapted to special requirements. EcoMark not only optimizes the laser process, but also looks at the processes in front of and behind the machine. With individually coordinated supply and discharge systems, it optimize the entire process and reduces the biggest cost driver (personnel expenses) to a minimum, thus offering the best solution for every customer! If the requirements change over time, the machine can also be supplemented with other modules afterwards. There are different strengths of lasers available and the machine can be equipped with 30 W or up to 120 W laser power as required. "The consistent development has enabled us to equip our machines with a fast 3D camera, allowing process times of 0.1 seconds per fruit and laser. Up to 50,000 fruits can be lasered per hour," said a spokesman for the company. During the development of the EcoMark software, user-friendliness was a top priority. After all, the customer should be independent in everyday life, being able to respond flexibly to every product and every marking. Trained employees can independently set up the machine for all new products and logos and the machine operator only has to press the start button. A production change is possible within a few seconds. The user-friendly software can switch to another product with just a few adjustments. 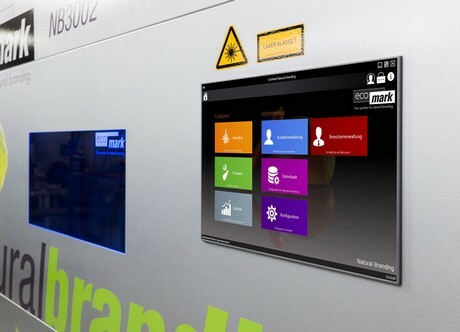 The intelligent EcoMark software makes the machine flexible and optimizes the productivity of the laser. Product characteristics of fruits and vegetables can change, for instance maturity level, moisture content and age. Thanks to the EcoMark software, adaptations are quick and easy. Flexible and fast means economical. Natural branding is advantageous for marketing promotions for a variety of occasions, be it a pumpkin for Halloween, something with oranges for Santa Claus in December, or an Easter bunny in April. Without the well-known lead times and without additional costs, the producer can respond individually and quickly to each customer request. New logos and texts can be imported easily and in a few seconds. 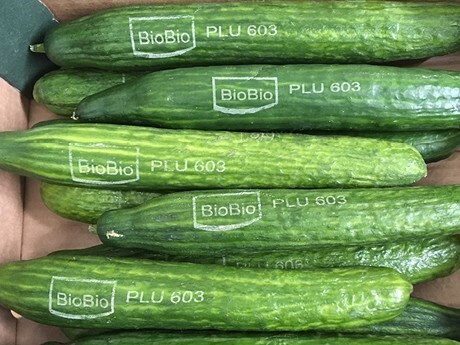 Laser labeling -including handling- costs upwards of 0.3 cents for a kiwi, for example. This is roughly equivalent to the cost of purchasing a sticker, plus its application and administrative costs. "With that kiwi, there is also the risk of the sticker not sticking to the shell, because special, well-adhering adhesives are often not approved for every product, and most of the time the sticker is made of plastic, which causes problems later in the composting plant." However, the economic advantages are clearest. On average, fruit packaging weighs about 20 grams. There is also a sticker for labeling. In addition, there is the problem of over-portioning when the packaging unit is sold by weight, which can result in losses of up to 5%, as well as disposing of a complete packaging unit as soon as a single object has been removed. "The result is double damage from 100% lost revenue and additional disposal costs - avoiding packaging significantly reduces the carbon footprint, as every ton of plastic saved reduces crude oil consumption and protects the environment."